Background: St Blaise was a medical doctor and throat specialist. He was also appointed a Bishop. 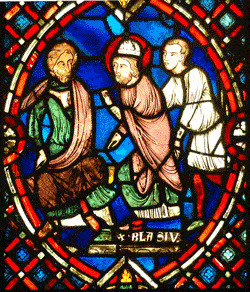 A very devout and holy man, St Blaise performed numerous miracles in his lifetime. In 316 he was arrested, beaten and beheaded for refusing to renounce his Christian beliefs and practices. As he was being led to his martyrdom he saved the life of a young boy who was choking to death, caused by a fish bone in his throat. St Blaise remains very popular and throat blessings are a common practice. The Feast of St. Blaise is 3rd February. Almighty and eternal God, with lively faith, I stand before You and ask for your help and mercy. Illuminate the darkness of my mind with a ray of Your heavenly light and inflame my heart with the fire of Your divine love, so that I may contemplate the great virtues and merits of the saint in whose honor I make this novena. and may “Thy will be done on earth as it is in heaven”. O God, through the intercession of Your Holy Bishop and Martyr Blaise, deliver us from all evil and ills, especially from ills of the throat; and grant us the grace to make a good confession in the confident hope of obtaining Your pardon, and forever praising Your most Holy Name. St Blaise, gracious helper of mankind and faithful servant of God, who for the love of our Saviour suffered many tortures with patience and resignation; I ask for your powerful intercession. Preserve me from all evils of soul and body. God gave you a special grace to help those that suffer from ills of the throat; relieve and preserve me from them, so that I may fulfill my duties, and with the aid of God’s grace perform good works. I also ask your assistance as special Helper of Souls, that I may confess my sins sincerely and obtain forgiveness. My Lord and my God, I offer up to You this petition in union with the bitter passion and death of Jesus Christ, Your Son, together with the good works of His immaculate and blessed Mother, Mary, and of all saints. Look down upon me, merciful Lord and grant me Your grace and Your love, and graciously hear my prayer. Amen.